Are you wondering if it’s worth getting a hypnotherapy certification? There are plenty of possibilities that you can explore with your certification and being a certified hypnotherapist. You can start your own private practice upon completion of your training. Accept a full client load and be on your way to being your own boss. Experience what this entails, starting with making your own hours and charging for services rendered on a per-session basis. Depending on the time spent per client, you can see 15 to 30 clients per week. This translates to a steady stream of income. 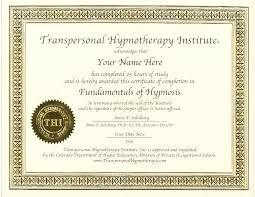 In no time at all, you can recoup whatever you invested in hypnotherapy certification online. Want to spend only a part of your day on your hypnosis practice? You can choose to only work with 5 to 15 clients per week and do something else with your time, such as continuing education or other productive pursuits. As a part-time hypnotherapist, you can pay to use a room on a per-need basis rather than a monthly lease. You can also share an office with another practitioner in a holistic health centre, or you can work at home. Suffice it to say that with your hypnotherapy certification, you can enjoy flexible work hours that return both monetary and engaging rewards. Hypnotherapy can be added to a variety of existing practices, such as holistic medicine, life coaching, massage therapy, and acupuncture. If you’re looking to bring in extra income, a career in hypnosis will work to your advantage. What is even better is that it adds variety to your day-to-day activities. You can switch from one practice to another to eliminate monotony while ensuring a steady income. On the other hand, your clients will have a deeper mental and spiritual experience. Instead of just massage therapy, you can work on their anxiety and stress as well. Your hypnotherapy certification is not just for the benefit of your clients but also your own. The life-changing techniques you learned you can use for your personal growth. Even if you decide against starting your own practice, the spiritual growth that occurs during training makes it a worthy investment. An accredited training centre is a good start but should not be the only basis for your choice. Make sure the course taught is well thought-out and structured. Trainers must have essential expertise and experience as well. It is also important that their teaching style suits your learning style. Do you learn better through practical skill-building exercises? Speak to trainers and find out. Communication is important. Make sure you can communicate directly with your trainer and seek support whenever you need it. Cascade Hypnosis Center offers a systematic approach to professional and modern training in hypnosis and hypnotherapy. Enrol in elite hypnosis and accredited hypnotherapy training and education that will lay down the foundation for a successful practice and both business and personal growth. For more information, visit https://cascadehypnosistraining.com/hypnosis-hypnotherapy-certification-training/ today. With much to see from the waters, it’s no wonder that Sydney is a popular destination for sailing and yacht cruises. This only shows that there’s so much to gain when you learn to sail in Sydney. After all, you won’t be sailing just for the view. Well, okay, the spectacular view of iconic landmarks, such as the Sydney Harbour Bridge and the Sydney Opera House, is reason enough to sail in Sydney. But you have to admit that there’s something fulfilling when you learn the skills that will take you to secluded beaches and bays and other destinations. Sydney learn to sail program is an opportunity to do something different. Learning to sail means you’re not just a spectator or a passenger on the side but at the helm, literally. This will give you the joy of freedom, friends, and family. When you learn to sail Sydney schools offer, you will have the freedom to go places and discover new ones. Just like when you learned to drive a car, the possibilities are endless. And with plenty of places in and around Sydney that are just waiting to be explored, being able to sail on your own and at your own time makes the whipping you got from the first few days of classes to learn to sail in Sydney worth it. There’s a giant network of people that share the passion in sailing. After all, the sport has historically attracted high achievers and will make anyone who becomes part of that network one of the crew. These people can be your new friends. Find a group of like-minded people that you want to hang out with and you can expand your friend base. Easily add a mix of those who prefer road trips and those who love to sail when you enrol learn to sail in Sydney programs. Join a sailing club and you can make more friends and even enjoy discounts and freebies. Sailing is for everyone and doesn’t discriminate by age. It offers an equal opportunity for grandma, grandpa, mum, dad, and your siblings. Once you learn the ropes, you can encourage them to take up sailing as well. This can be a great family bonding activity. Flying Fish offers RYA /AS accredited courses that run for 2 days or up to 4 weeks, depending on the classes you enrol in. There’s also a self-paced online course of Essential Navigation and Seamanship that you can look into. Enrolling in accredited sailing courses is the best and most fun way to learn. You can also get a discount of 25% on Middle Harbour Yacht Club sailing membership, your doorway to meet like-minded individuals. So what are you waiting for? Contact Flying Fish today. You can use Neuro-Linguistic Programming, or NLP, to improve your life and to have a much easier time communicating with other people as needed. NLP is designed to help you learn about how to communicate with other people the right way and to avoid the struggles that often come with being unable to be on the same page as other people. You can use NLP training course to make it easier for you to learn how to work with the right communication skills with ease while being the best NLP practitioner around for the goals that you might hold. The courses that you can use from Performance Partnership can work wonders for the needs you have when learning about ways how you can interact with others. Courses can cover points on how to manage energy and keep it ready as demanded. This includes knowing how to focus positive energies as needed. This can really do wonders for your life as you will understand a little more about yourself and how you want to keep your brain ready. By being trained and versed in NLP, you can find that your life will improve exponentially. You will be able to actively interact with other people and talk with them about how you can get people in touch with people in your family, your workplace and many more spots in your life. You can use the practice to help you improve your life and keep yourself from being at risk of excess harm in any way. You can also learn how to free yourself from many difficult problems that might come about in your life. The feelings of grief, fear and worry that may be pervasive in your life will be eliminated as you will have a much easier time feeling safe and comfortable with yourself. This should enhance the ways how your mind works and give you a little bit of extra control for whatever it is you want to get out of your life. An NLP training course can also help you in learning a little more about how you can use many parts of the human mind to your advantage. These include courses dedicated to working with such points as the subconscious and unconscious. A good part of NLP comes from the use of hypnosis to help people control their thoughts in ways that help them to stop smoking, lose weight and get into many activities dedicated to keeping the human body from being at risk of serious damages due to certain physical activities. A good NLP training course can really do wonders for you if it’s the right fit to your needs. You can contact Performance Partnership today to take advantage of the best possible courses that you could ever use. You can contact Performance at +440 (0)20 8992 9523 to get help and support for the many demands that you might have or you can visit them at performancepartnership.com. These points that you can discover when studying the art of NLP can certainly make a difference in your life. You can pick from a range of professional opportunities like being a business owner, a lender, a non-profit organization employee, a writer for finance articles, or perhaps a monetary adviser for a company or a private individual. You’ll be in high demand given that your abilities and credentials involve providing assessments and helping with overseeing plans, properties, and all types of finance-related decisions.